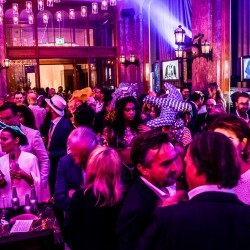 THE DUCHESS had invited a lot of celebrities and other interesting guests who are living in Amsterdam to the opening night and the beautiful and energetic party. Everybody was impressed by the beautiful interior and the excellent details. 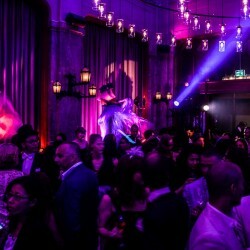 The ambiance and the atmoshere was breathtaking and all the guest where treated like royalty. The name THE DUCHESS is based on the traditionally aristocratic or royal presence, known for sophistication, elegance and class. THE DUCHESS, inspired by the splendour and eminence of the era known as the Belle Époque, will grace the city of Amsterdam with her presence as of this summer. THE DUCHESS will introduce Amsterdam to the elegance of traditional London hospitality, balanced with Viennese grandeur and the subtle flavours of Southern France. True to her imperial roots, THE DUCHESS resides in one of Amsterdam’s best-kept historic gems; the former KAS Bank and the new W Amsterdam. The magnificence of the original ornaments, the high ceilings and the accents of gold and marble, make THE DUCHESS a luxurious sanctuary in the bustling heart of Amsterdam. All flavours at THE DUCHESS are carefully prepared in the state of the art, handmade Molteni kitchen. The beautiful, custom-made Molteni is an impressive centrepiece fit for a king and gives the kitchen an extravagant touch. The kitchen is a sight by itself and boasts the highly exclusive chef’s table right in the middle of the kitchen: THE DUCHESS Table. THE DUCHESS lunch and dinner menu is inspired by the light and refined flavours from Southern France and Italy, also known as Nouveau-Niçoise Cuisine. Cuisine Niçoise originates from the old town of Nice where French Mediterranean cuisine has blended and evolved with influences of Italy across the border. The use of local produce, notably artichokes, courgette, lemons, olives, tomatoes, peppers, truffle and a variety of seafood, meat and fresh pasta, compose a cuisine that is light and healthy. The extensive menu offers eclectic classics with a fresh twist such as luscious Fruits de Mer platters, Rotisserie and grill specialties as well as home made ice-cream coupes prepared at the table. The afternoon tea has a prominent role in THE DUCHESS. The extravagant displays in the tea lounge offer a spread of niche pastries and scones served with signature marmalades and conserves. The afternoon tea can be enjoyed with one of the many tea-blends or true to the royal nature of THE DUCHESS, with an extensive list of champagnes in the exquisite tea lounge. All beverages at THE DUCHESS are seamlessly integrated into the guests dining experience. THE DUCHESS beverage menu is due for world renown as one of the most complete and skillfully presented anywhere in the world; with signature cocktails and punches. 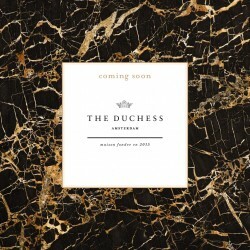 Together with a highly skilful team of acclaimed international bartenders, THE DUCHESS is about to redefine the local beverage scene. 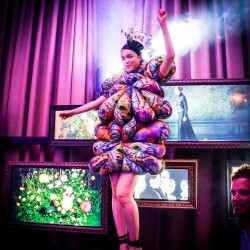 THE DUCHESS’ communal atmosphere of opulence starts with a savvy selection of Punches and some highly creative adaptations of French and Savoy Apéritif. This includes a selection of punch and French Vermouth, and a wide range of traditional-styled beverages using Absinthe and Pastis. The cocktail offer includes a uniquely balanced selection of refined and often-overlooked beverages from the heyday of the last cocktail era. For those who care more for sparkling drinks, THE DUCHESS also offers a royal list of different champagnes. A tailor made wine list, complementing THE DUCHESS cuisine, boasts the most exclusive wines from around the globe. At the bar guests can enjoy both the rich and wide range of beverages as well as THE DUCHESS cuisine. THE DUCHESS is situated in the heart of Amsterdam, just minutes away from the Royal Palace. The building, the former KAS Bank built over 100 years ago, pulses with heritage and history; boasting high ceilings, impressive stained glass windows and many original fixtures. 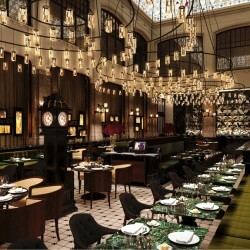 THE DUCHESS found her inspiration in the spirit of ‘Grand Brasseries’ and the history of the former Bank, yet infused it with her own eccentric character. As such, the lavish contemporary interior perfectly balances the elegance and sophistication of her distant royal past with the comfort and intrigue of our time. 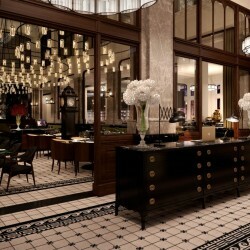 The overwhelming central hall with its ornamented glass ceiling, its black and marble details, a beautiful hand crafted floor tiles and the intricate wooden doorframes, all create an easy-going ambiance. 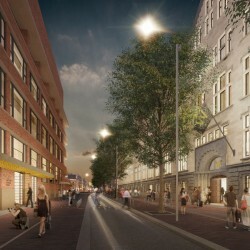 The property is no longer an exclusive domain but rather a city place which acknowledges the great value of simple things, suggesting the past and present can do more than co-exist; they can enrich one another. The remarkable tea lounge, with an incredible view over the Singel, reminds one of an Alice in Wonderland tea party with an abundance of teacups, teapots and cake tiers. The inspiring and unique design is done by internationally acclaimed and award-wining architecture firm; BK Architecture. 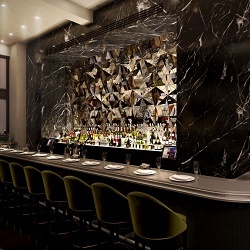 THE DUCHESS is a proud member of The Entourage Group; an unexampled hospitality imperium, creating and building internationally acclaimed concepts such as MOMO, IZAKAYA, The Butcher and SHIRKHAN. 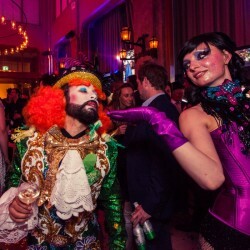 THE DUCHESS restaurant, lounge and bar is situated in the heart of Amsterdam in the former and historic KAS Bank. Her name is based on the traditionally aristocratic or royal presence, known for sophistication, elegance and class. Besides her heritage, THE DUCHESS is known for the Afternoon Tea, featuring refined niche pastries and champagne. The lunch and dinner menu at THE DUCHESS is inspired by the light and refined flavours from Southern France and Italy. To complete the grand experience, THE DUCHESS serves an impressive selection of beverages including punch, cocktails and various digestives. The Entourage Group is an unexampled hospitality imperium, creating and building internationally acclaimed concepts including restaurants, hotels and other high-end locations across the globe. Their wide range of expertise has been cultivated extensively through years of hotel management, operations and fine dining experience. Collectively, their strengths and experience inspire The Entourage Group to continue to set the new standard for modern hospitality. 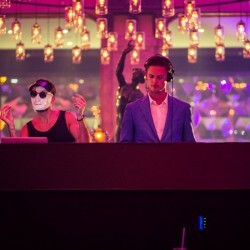 The currently owned & operating brands include MOMO Amsterdam, IZAKAYA Amsterdam, The Butcher, SHIRKHAN and the upcoming THE DUCHESS, Mr. Porter, Entourage club, IZAKAYA Munich & IZAKAYA Hamburg. Sfeervolle Gentlemen’s Evening bij “Pakkend” was van Top Kwaliteit!